This has been a crazy week in my house. Both of my sons graduated from college – one from undergraduate school and the other from dental school. 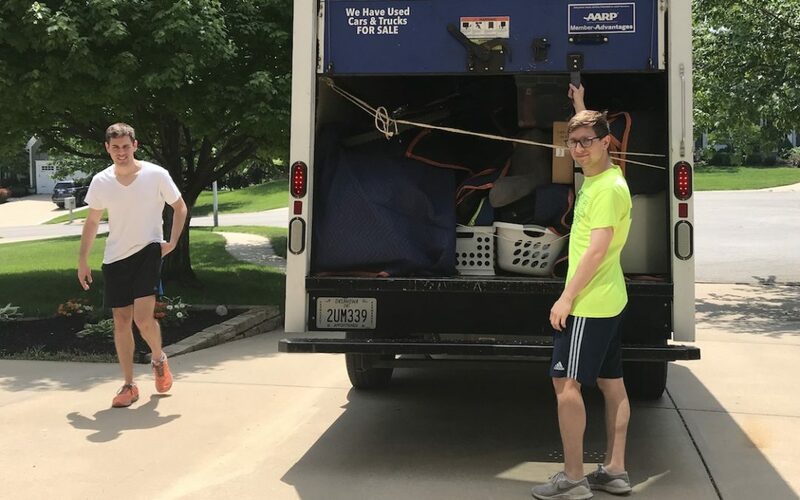 We moved all of their stuff (and there was a lot of it) into our garage and house because they are both joining the trend of young professionals moving back home to save money. They are both targeting one year at home. My husband and I spent months getting rid of stuff only to have the new peaceful zen of our house upended with the equivalent of two apartment’s worth of kitchen items and furniture. Amidst the chaos, I feel such gratitude that we have a big enough house to allow our sons to move home and have some space for themselves. I also feel enormous gratitude for the close connection and great relationships we have that cause them to want to move back home. There is both good and bad to them moving back home. The TV is on a lot now, and our privacy is much more limited. I also have to plan dinners and cook more now, and the dishwasher and washing machine have been in overdrive. The house is more cluttered and we have to make sure we don’t lock someone out on weekend nights. Overall, I feel my personal freedom is limited by my sense of responsibility and mother-like worry about my children’s well-being. In many ways, it’s so much easier when they are away at college and we don’t know what time they come home at night, what food they eat and whether they get adequate sleep. But there is a lot of good to this too. This is one more year for our family to be really connected, to enjoy one another’s lives, to be there to support one another and to have both big moments and small moments together. My family is the most important thing to me, and I have worked really hard over the years to foster the kind of environment and encourage the types of events that would grow strong sibling bonds. More than anything, I wanted my kids to really like one another and to want to be active in each other’s lives. About a year ago, my Dad died 5 days before I was due to visit him at my parent’s home in upstate NY. I hadn’t visited in 4 months, and I was looking forward to seeing my parents and asking my Dad more about his childhood. My Dad was 91 and he seemed eternal, like he would be a fixture in our lives forever. I wish I had more time with him. My grief catches me out of the blue on some days, and I wonder what it must be like for my mother, to feel the emptiness where a life partner once was. Feeling the loss of my Dad over the past year has caused me to reflect even more about my own family and how fleeting time is and how things can abruptly change. So I’m finding joy and gratitude in this year of the boys at home. We will have family dinner on Sundays and we will continue our family tradition of going to one another’s activities. We will be silly and make inappropriate jokes. The dogs will run everywhere and we will laugh and we will fight and we will make up. We will sit at the dinner table for an hour after we are done eating, to talk and laugh and connect. We will be family.